How would you like to spend four years in sunny Tampa, Florida, with beaches nearby, a major airport for travel, a new honors residence hall to live in–and extremely generous merit scholarships? By extremely generous, we mean a full ride for National Merit Scholars. As for the housing, Summit Hall just opened in Fall 2017; directly across the street is a new fitness center (The Fit) and pool, and a short walk down the block is The Hub, a new dining facility (seating 400) that allows advance food orders online. And in 2018, students will have no more than a three-minute walk to a new Publix market. 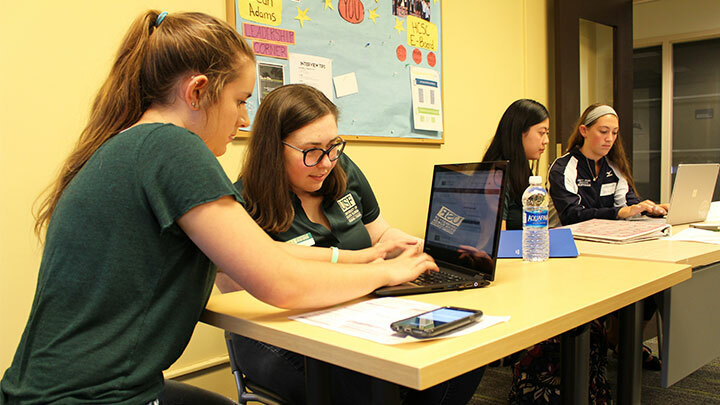 Summit also offers dedicated classroom and study spaces, social areas, resident counselors responsible for programming, and an Honors faculty member in residence. “The Fit is located within The Village on the North side of the USF Tampa campus. A state of the art recreation facility and wellness center, The Fit serves all USF students’ recreational needs. 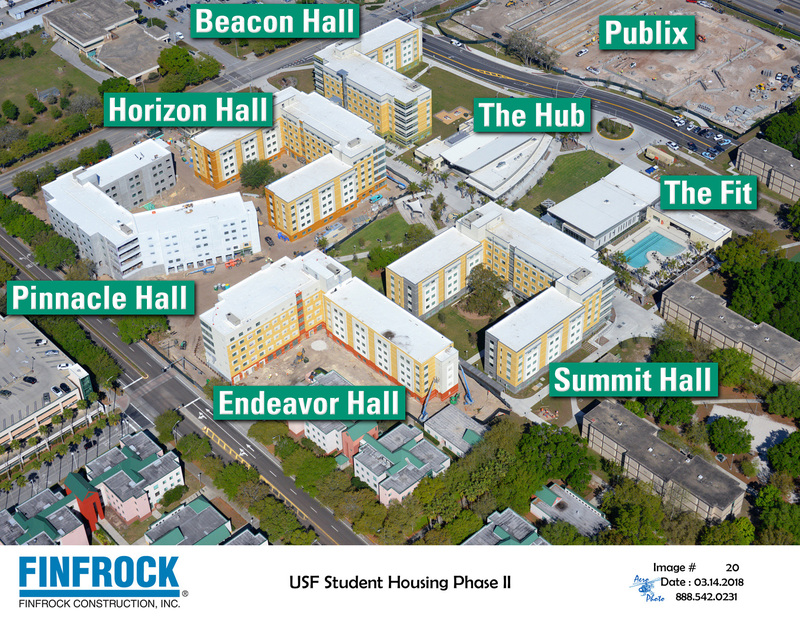 USF’s “Village” from the air, showing Summit Hall, The Hub, and The Fit. 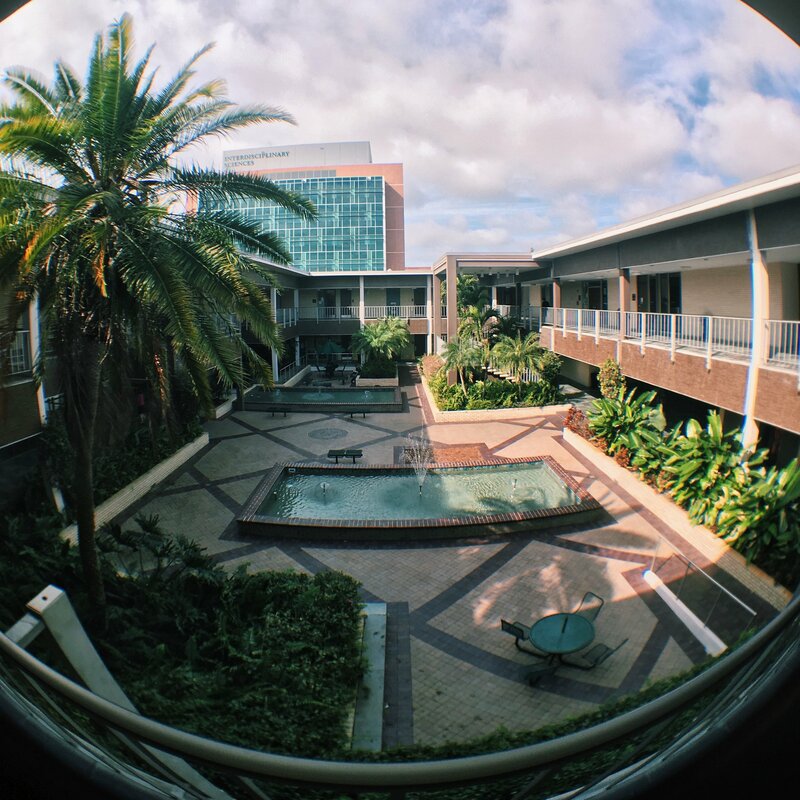 According to USF, “Summit is part of The Village complex, the largest Public-Private Partnership in Florida higher education to date, featuring state-of-the- art dining and recreational facilities alongside residential halls.” Summit is home to about 500 students who live in traditional double rooms or suite-style rooms with private baths and in-room sinks. Honors students have student mentors when they arrive. On the ground floor is a full kitchen, gaming area, media lounge, TV lounge, multipurpose room, conference room, and large laundry room. Each floor also has an activity lounge and study lounge. Florida students with a 4.0 weighted grade point average, and either a 1400 or higher on the SAT or 30 or higher on the ACT, will be automatically admitted into the Honors College once they are admitted to USF. Out-of-state students who win the Green and Gold Presidential Award (up to $12,000 per year) also earn automatic admission. $800 during the third or fourth year after completing the college’s academic requirements. “Most Honors College students also qualify for very generous travel scholarships to fund study abroad opportunities. Students may apply for these Honors-specific awards as well as National Merit and other awards. These applications typically open in November and are due in January for new students and April for continuing students. Honors students register for classes with the first group the entire time they are members of the college. The college has an interesting and varied curriculum, including core honors courses, 50 hours of community service, global experiences (extra foreign language credits, study abroad, or certain courses), and a capstone or thesis requirement. Honors Dean Charles Adams describes the honors college as a “kind of mosaic. Our students come from every academic college on campus, and nearly every major. Our faculty is drawn from a wide variety of disciplines – art history, physics, anthropology, sociology, philosophy, literature, urban planning, architecture, and environmental sciences. And our interdisciplinary curriculum spans the natural sciences, the humanities, the social sciences, and the arts. We are pleased to announce that the USF Honors College will be included in the upcoming 2018 edition of Inside Honors, to be published this fall. This entry was posted in Uncategorized by Honorsadmin. Bookmark the permalink.